Local newspapers were often critical of the conduct within the Jackson Prison. A photo taken at the Thanksgiving dinner hosted by Chaplain Ewert. Historically, the Michigan State Prison, commonly known as Jackson Prison, has had quite a checkered past and legacy. Though controversy continues to surround the prison presently, a significant amount of scandals made headlines regarding the prison from the 1920s to 1940s. These early scandals are a critical part of the history of the Jackson Prison, including inadequate prison condition and and a variety of intolerable acts committed by inmates and prison personnel. As a public institution, the Jackson Prison was subjected to scrutiny by the American public. The intolerable acts that surrounded the prison often were deemed scandalous by the public and spread through communities specifically extending into local newspaper headlines. These newspaper accounts illuminate the public’s perspective of the prison and its relation to scandal and provide telling evidence which is elaborated upon in the following narrative. Reading contemporary newspaper accounts, decades or nearly a century after their publication, some headlines portrayed as significant seem little more than small-town gossip. Scandal regarding the prison published in the newspapers demonstrates what the public prioritized and valued. The question of how prisoners should be treated, what respectful behavior was, both of prisoners and staff, and the authority prisons cultivated in society are debated and illuminated within the newspaper accounts. The debate surrounding the American public’s societal values plays out in the expanse of scandal which ranged from prisoner treatment, the actions of prisoners and the personal life and work decisions prison staff members made. Treatment of inmates has been a story told many times over by investigative reporters and newspapers, specifically scandal has often centered around inhumane treatment. However, it can also be considered scandalous when prison administration treats their prison population too well. In 1934, the Detroit Free Press described a situation which attests to this point. The account described a Thanksgiving dinner hosted by the prison Chaplain in which 18 inmates were allowed to attend. The language used to describe this event is quite disapproving: “[The Chaplain’s] pampering of desperate Michigan convicts has been forced on the public’s attention repeatedly in recent months…. [The dinner] has shocked the warden himself”. The inclusion of prisoners in the holiday festivities is deemed “pampering”, signaling that the public believes prisoners are unworthy of the Chaplain’s hospitality and kindness. Beyond treatment, the article highlights the perception many individuals in the American public held regarding inmates. Inmates were indeed criminals, an idea exemplified in article’s documentation of the guests’ crimes: “a good time was held by all -- including two murders, a kidnapper, nine hold up men, a bank robber, three housebreakers, an arsonist and a bogus check passer”. The Detroit Free Press decision to include convicted crimes demonstrates their perception of Ewert’s Thanksgiving guests; The paper imagined inmates as criminals that were unworthy of kindness. The urban paper ultimately and intentionally dehumanized the men (1). Scandal regarding the treatment of prisoners often extends into the relationship between inmates and prison staff. Similar to the Thanksgiving scandal, a guard became the center of a 1926 scandal that received extensive newspaper coverage. The guard was caught dispensing narcotics at the prison in exchange for bribes; as well as, accepted “bribes to obtain the release of prisoners on parole”(2). The scandal highlights that the public had a keen eye regarding prison staff were also subjected to the small town gossip that came with criminal behavior. Scandals regarding prisoner treatment often connects to the numerous scandals that surrounded the criminal behaviors of prisoners, and sometimes guards. Criminal behavior behind bars was quintessential to the imprisonment of the Purple Gang; A notorious Detroit and Jewish gang known for its involvement in several criminal rackets including bootlegging. Incarcerated gang members allegedly bribe prison officials to receive special treatment. Between 1920 and 1965 there was always one member of the Purple Gang serving a sentence in Jackson Prison. Some examples of the criminal behavior that the Purple Gang was involved in while in prison include “gambling, murder, graft and corruption, and prostitution”(3). The Purple Gang used their vast resources to bribe prison guards and administrators to gain special privileges while inside the prison such as the ability to leave the prison grounds in extraordinary instances. Oftentimes, the Gang would go out on weekends for a night on the town and then come back to prison after the weekend was over. As local newspapers described: “professional murderers and criminals of every other type were apparently allowed to do as they pleased in connivance with prison authorities”(4). Beyond bribing, the relationship between some prison officials and gang members was more business-oriented as they worked in various ways to make money during the Prohibition years. One newspaper account describes an illegal scheme in which “liquor was manufactured within the prison and that it was (also) smuggled in from outside for the use of both convicts and prison officials”(5). The Jackson State Prison thus repetitively made newspaper headlines throughout the decades illuminating the corruption of the prison in relation to the treatment of prisoners, whether it be too well or horrific, and often distinctly centered on the prisoner-guard relationship. Prison corruption was not the only way the prison staff made headlines. Their personal lives were also under the microscope of the local media in ways that are completely different from today. Though there is still gossip from various media outlets in today’s society, it is often about celebrities or well-known public figures. However, if you worked at or were involved with the Jackson Prison System your life faced an uncomfortable amount of scrutiny. An example of this excessive scrutiny occurred in 1928 when a newspaper article highlighted that the Prison chaplain’s wife was filing for a divorce and even disclosed the reasoning for her decision: “[he] consorted with women of questionable character, he indulged in drinking and treated his wife cruelly”(6). It is hard to imagine that in the present day, such a detailed newspaper article regarding a prison’s officials’ divorce would make the headlines; however, such a source illuminates the societal values of the era, the significance the public placed upon positions within the prison and their expectations for these officials. Even a connection to a prison official could bring small controversial instances into the headlines. 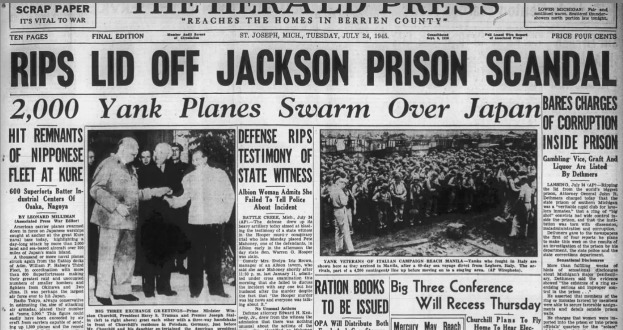 Years later in 1934, the media covered an instance which starkly related to the Jackson Prison. The newspaper reads: “Reverend Albert Ewert’s 19 year old son placed under a $10 bond after being in a car accident while intoxicated”(7). Jackson Prison, thus, made newspaper headlines regardless of the nature of the scandal and demonstrated that indecent behavior within the criminal justice system, both internally and externally, were subjected to public scrutiny. The historical legacy of the Jackson Prison can not be completely understood without the inclusion and interrogation of scandals. From the Purple Gang to divorced religious leaders, scandal seemed to go hand-in-hand with daily life at the prison. Newspaper accounts illuminate the corruption which occurred both in the prison and the lives of those associated with the institution. The inclusion of these intolerable acts in the newspapers contextualizes the Jackson Prison System in regards to the leading societal values and perceptions of the 1920s to 1940s. 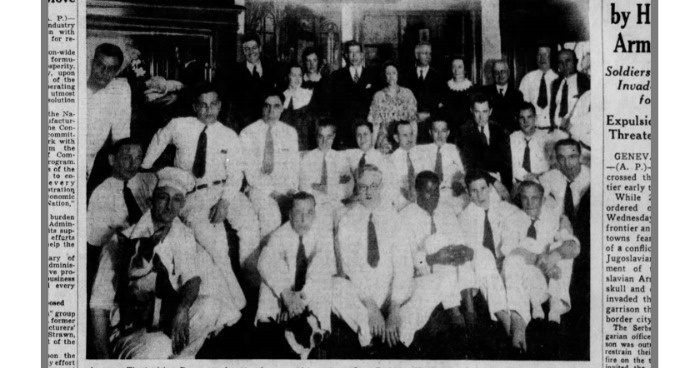 (1) “Chaplain Fetes Felons Outside Prison Walls”, Detroit Free Press, 1934. (2) “Jackson Prison Employee Arrested”, The Herald-Press, 11 August 1926. (3) "Graft, Prostitution, Degeneracy, Graft Told in State Prison Probe”, The News-Palladium, 11 April 1946. (4) “Prison Scandal Reveals More Rotten Politics”, Detroit Free Press, 25 July 1945. (5) “Bares Charges of Corruption Inside Prison”, The Herald-Press, 24 July 1945. (6) “Divorce Plea Flays State Prison Chaplain”, Detroit Free Press, 26 August 1928. (7) “Jackson Prison Chaplain’s Son Faces Trial as Drunk”, Detroit Free Press, 24 December 1934.